Ø§Ù„Ø±Ø¦ÙŠØ³ÙŠØ© / mobile / new tech / Sega embarks on PC "retrogaming"
Sega embarks on PC "retrogaming"
MegaDrive, Saturn, Dreamcast ... Sega is back where we did not expect: the brand will launch a range of portable PCs in Japan, the colors of the old consoles. Sega has teamed up with the company Enterbrain to get out of notebooks, with the effigy of his old consoles. Products that are clearly nostalgic for the days when Sega was still "stronger than you." 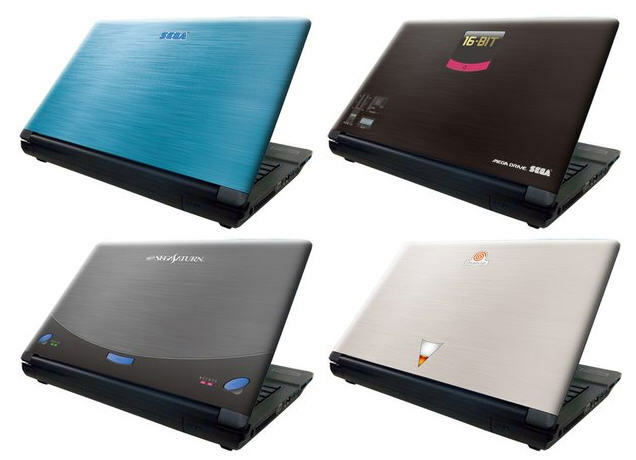 For the moment, only the Japanese will get laptops Sega. Customers can choose the outer shell of their choice: either marked Sega logo or that of a famous old consoles (Sega Genesis, Saturn and Dreamcast ...). The price of these new PCs should range from 100 to 200,000 yen (1069 to 2138 dollars). High tariffs but since this product seems to address the collectors and lovers of retrogaming, we would not be surprised that the brand is a great success. The four models are equipped with a 15.6 inch 1920 x 1080 pixels. Then, each of them has specific characteristics. The computer has a blue marked Sega 2020M Intel Pentium, 4GB of RAM, and a 500GB hard drive display is entrusted to the IGP included in the processor. The PC will have a marked Mega Drive Intel Core i3-3120M, 8GB RAM and a GeForce GT650M for graphics card. It will also be possible to play Blu-Ray. Side of Saturn: an Intel Core i7-3630QM and a 120 GB SSD For PC Dreamcast, it is even possible to burn Blu-Ray.